Again, thanks all - a tough weekend made a little better by your thoughts and presence and silent likes : ) on this old re-post. I do believe those who only find strife here on this site aren't really looking for anything else, imho. "...it's been a while, maybe time to re-watch." If memory serves correctly, the film centers on a journalist's search for the meaning of Kane's last words which are spoken in the opening frames; "rosebud". Mmmmmmmm. What a luscious story, all the while, illuminated underneath by the pearlescence that these bowls have imparted to the plenties of your life. I'm glad to recognize some similar travelings and travails, but am revered by this, thinking what may come of my own few-left, but well-traversed icons. Keepers, all. Thank you, Anna, for both acknowledgement, and permission! What a treat, Ms. Rita and Ms. Songbird, to have you come by. Sorry to hear you, too, are here with sadness and news of a death, Rita. I am seriously missing the writers and poets this week, where we'd bring all our days to the forum and just share and exchange and lift each other up. I was inspired to write more, write better, too. It was a life changer and wonderful moment the first time I showed up and found you all - and there are plenty of lovely times like that in a lucky life, but I am particularly grateful for 'our time' when the moon (or sun) shone down on us all and we played. And wrote. And laughed and cried. And thank you Songbird, your comment I read several times, along with Ron Powell's comment, made me ponder those inanimate objects that carry our experiences and sometimes emotions, a bit of the vibration of use over the years.... touchstones, of a sort. I grieved myself into getting ill this week, I guess, my reserves were shot, already. Didn't know where to put the shocking images my brother gave me in his own shock and grief. 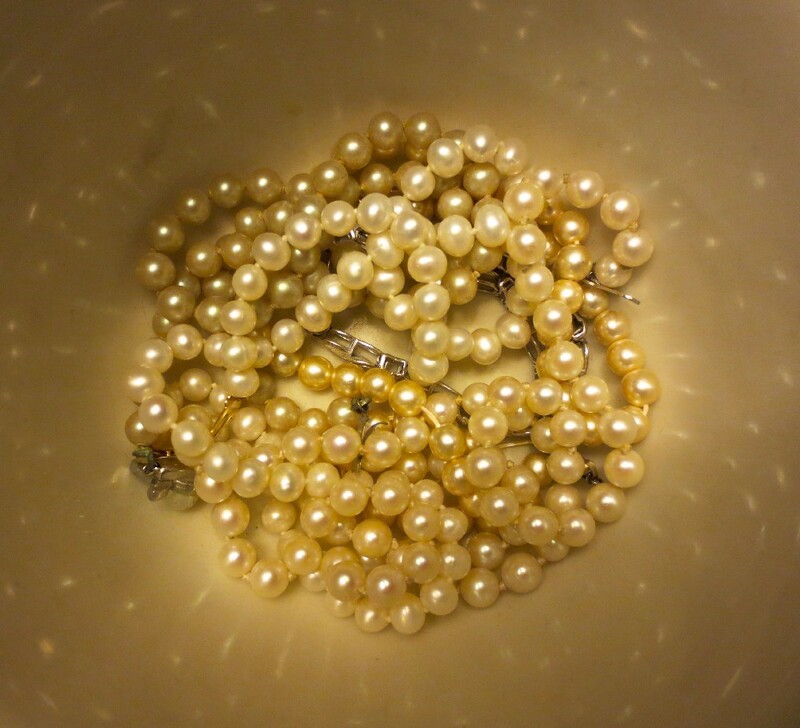 It’s quite remarkable, how you capture movement, physical and psychic, as well as stillness, by putting the pearls in the bowl. Looking inside, we see starlight. My condolences to you and rita. I’m sending you both strength and softness on the early summer breeze. These last comments. A treat! Thought provoking. Back in awhile. Catch, your comment sparked an interesting conversation over here, on the beauty some have in their words and ways of seeing that seem to produce beauty in the mind for me, period. All from: Looking inside, we see starlight. Loved it! Thank you. And also for understanding my symbolism of pearls, for lack of a better way to express my own reasoning/desire in marking my arcs in adulthood, my wandering and footloose and living on the edge eras. It was a beautiful, priceless time, for all the anxiety of day to day, sometimes. On re-reading this post, this line struck me this time around, perhaps due to the thoughts above: For two decades now, the bowls have lived mundane lives in suburban homes. And I now think it's time to re-phrase this more settled era as it's hardly been mundane, just to a naturally at heart wanderer, maybe, but these past two decades have had their own thrills and joys, just more internal wanderings and deeper, more still, growing and exploration. Wandering conversations are my favorite. I think you are right about the effect of generations that fear and control and refuse to enjoy creative, primordial, organic creativity and expression...thankfully, no matter how stiff one’s heritage might be (I was raised in the most beautiful part of the planet, the Great Plains, by and among lefty-thinking Catholics who took very little of the church-going seriously until most of them just gave up on all that incense burning and sin categorizing) our natural inclinations are always available to us. I think I understand your line about the ‘mundane’ lives and your reinterpretation of it...a settled life after living wanderlust is such a contrast of energy. You’re right again, though, once I wandered into my own settled era, the inner growth that comes from roots established rather late in life has been more exhilarating than all my time twirling on the edge of not normal. It’s very special to have the space and time and experience, and utter lack of dourness, to create a profoundly wild inner garden. I’m hoping the words will come back soon...I’d love to pick up the writing again...there were days it was so easy, although not necessarily painless, thanks to folks like you and that old crowd that used to hang around these parts. I know I didn’t “know” the coolest kids but I sure read y’all. In the meantime, here’s to the light from Pleiades, so young, so close, so bright.